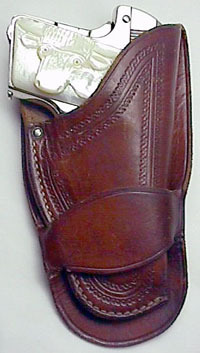 Colt Model N 1908 .25 ACP Pocket Hammerless Pistol sn 397049 - This is one of 15 guns shipped from Colt's fitted with factory carved mother of pearl grips. Of the 15 pistols, only eight were in the steer head pattern and seven were in the eagle pattern. The pistol is in original condition and the grips are perfect with no cracks or chips. Factory carved mother of pearl grips are an extremely scarce variation to locate for this particular model of Colt pistol. 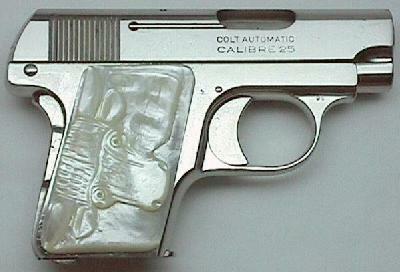 Another example of these grips fitted with ruby eyes can be seen on the Colt Model N Special Order Grips Page. 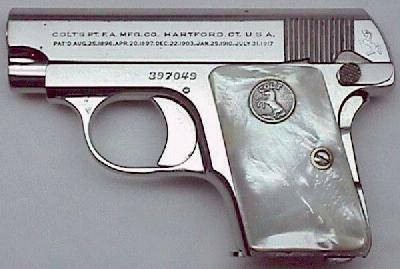 Assuming a total production for the Model N of 410,000 pistols, just one in 27,257 pistols (or .0037%) has these grips. Factory letter confirms these features and indicates that the gun was a single gun shipment sold to Harkins Drug Store, Refugio, TX and shipped to Corpus Christi Hardware Company, Corpus Christi, Texas on November 7, 1934. The box is slightly deeper than the boxes for standard production guns to accommodate for the extra thickness of the grips. Additionally, the box is numbered to the gun.